The RedKings Poker site has been around since 2006 and it has definitely earned the seal of approval from a great number of online poker players. The site is part of the Ongame poker network which will give a good level of confidence to anyone looking to find a reliable and reputable poker site. RedKings is not a poker site which allows US players to play. This is unfortunate but there are a great number of poker sites which are unable to provide US poker players with the action they require. In saying that, there is one major benefit in choosing the RedKings site and this comes with the fact that the site is Mac friendly. There is still a worrying lack of Mac options for serious poker players which makes this site such an excellent choice for any Mac player that wants to make the most of their poker opportunities. Mac users will be interested to know that the site operates with Mac OS X 10.2.8 or later in conjunction with Safari 1.0.2 or above or even Mozilla 1.5 or above. This should be suitable for the vast majority of Mac users and the process of downloading the software is a simple one. Anyone looking to make the most of their Mac while playing poker will be delighted with what RedKings has to offer. With many poker sites, you will find that there is a take it or leave it approach to the bonuses that are on offer. This is not how things operate with RedKings Poker though as new players will have a choice of 6 different welcome bonuses to select from. This is definitely a generous range of welcome offers which will be of great benefit to poker players but it doesn’t mean that players will have to spend some time weighing up the different options. Of the 6 welcome bonuses on offer, three are incremental bonuses and three are fixed bonuses so this is the first area that you need to choose from. The Hearts 250 bonus is aimed at novice players. For every 120 points that a player earns on site, they will receive a $10 bonus into their account. The maximum bonus a player can receive in this welcome bonus is $250 and a player will have 90 days to earn their bonus. The Diamonds 500 bonus is aimed at medium poker players. For every 500 points a player earns, they will receive $50 in bonuses. The maximum amount a player can earn with this promotion is $500 and a player has 55 days to clear their bonus. The top incremental bonus is the Kings 1000 and players will earn up to $100 for every 900 points they earn. The maximum bonus in this promotion is $1,000 and players have 45 days to clear this bonus. It is important to be realistic about what sort of poker level you will be playing at in order to maximise your benefit. However, if you are likely to play a lot of poker, there is a genuine opportunity to gain a lot of bonuses when you sign up with RedKings. The first fixed bonus is the Kingsize 1250 bonus where players can earn a 100% matched deposit bonus up to a level of $1,250. In order to receive their bonus, players will need to earn 10 times in poker points for every $1 of bonus that they are due. Players will have 30 days to retrieve their bonus. The Kingsize 2000 bonus provides players with a 100% matched deposit bonus up to a level of $2,000. Players will need to earn 9 player points for every $1 of bonus that they are due to receive and they will have 30 days to achieve this. The final fixed welcome bonus is the Kingsize 2500 where players can receive a 100% matched deposit bonus up to a level of $2,500. In order to retrieve their bonus, players need to earn 8 player points for every $1 of bonus they are due and they will have 21 days to achieve this. Some of the terms and conditions of the welcome bonuses are a bit restrictive so it is important that players ensure they find the bonus that is best for their needs. With refer a friend, bad beat bonuses and even a pocket red bonus on offer; there are plenty of ways to boost your bankroll with Red King. With RedKings not having to worry about US poker players, there is a wider sense of options when it comes to making deposits into player accounts. Poker players at RedKings will find that they can choose from Visa, MasterCard, Neteller, ClickandBuy, Click2Pay, FirePay, InstaCash, MoneyBookers, WebMoney and Western Union deposit methods. This ensures that there are online and offline deposit methods available to players, providing a greater degree of flexibility in funding your poker bankroll. One of the quirkier tournaments available to play on RedKings is the X2 promotion. This is where players sign up for two tournaments that are exactly the same and will take place in parallel. Both tournaments have a guaranteed $1,000 and have a $20+$2 buy-in. If you get knocked out of one tournament there is the chance to continue your play in the second tournament. 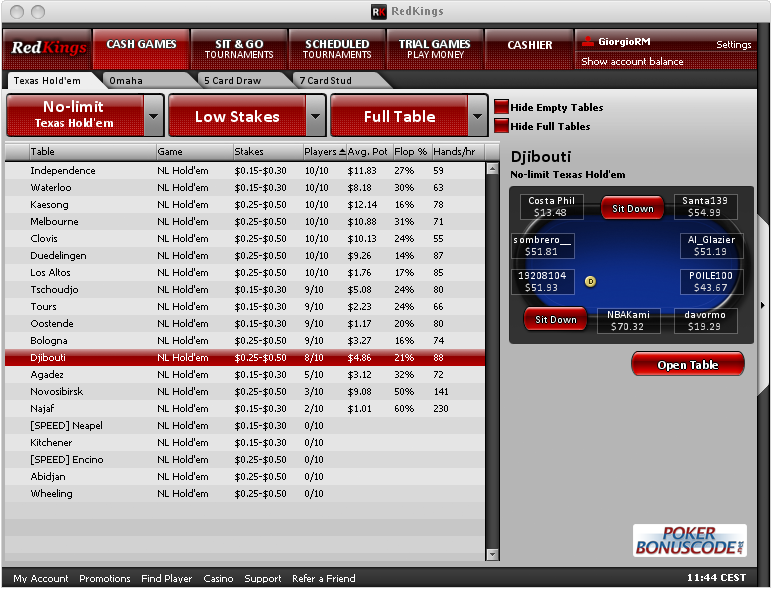 For players with a sizable bankroll to utilise, there is a High Roller event which runs every Tuesday. The buy-in stands at $500+$25 but there are qualifiers available on site so you can find yourself pitting your wits against the high rollers even without having to shell out big money. The big game on site is the ChampionChip game which takes place every Sunday. It is possible to buy a place directly for $190+$10 but there are daily qualifiers available on site which start from $1+$0.20. There is a guaranteed $200,000 on offer every week, which is a massive incentive for poker players to sign up with RedKings. One thing that an online poker site has to be wary of is ensuring that they cater for all of their players. 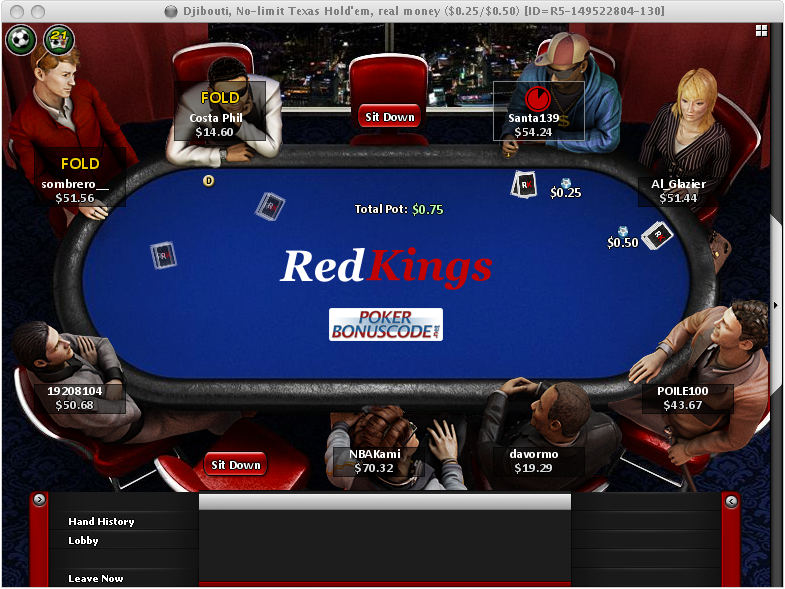 A poker site like RedKings has as global appeal and players log on from different continents and time zones. The site takes care of this by providing two tournaments a day from the major continents. The European Daily, the Aussie Daily, the Brazilian Daily and the Canadian Daily take place providing prize pools ranging from $1,000 to $14,000. European poker players can also benefit from the European Grand Prix tournament which takes place every Saturday evening at 20.00 CET. The tournament has a buy-in of $150+$12 while there is a guaranteed $50,000 on offer. There is also a Russian $4,000 daily game, which even allows players to chat in Russian. Anyone looking to make the most of a truly unique poker experience would be advised to check out RedKings. The range of welcome offers makes RedKings a site that is worth examining because the more flexibility there is for players, the better. The fact that there is a reliable Mac option is also something that works very well in the sites favour.